I had previously posted about the City of Sydney’s announcements for three new works for Sydney’s public spaces. click here. I have just read online the views of the Crikey urbanist, Alan Davies. There’s a lot more to say about this guy’s reviews and some of his strange views on urban issues . He has some serious problems! More on some of his comments later – watch this space. The comments from this urbanist are evidence for why such planners/urbanists should be kept right away from anything to do with aesthetics, let alone public art, anything to do with landscape or open space thinking. Here’s his review – click here. His suggestions for improvements to the art work are laughable. 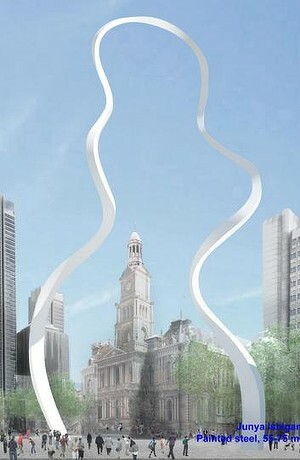 But let’s start with his opening lines: Sydney City Council’s proposed giant Cloud Arch sculpture looks good, but means little. Australia’s premier city should aspire to something more authentic than a giant logo. I just wonder what he would think of the Cloud Gate Sculpture in Chicago’s Millennium Park. click here. Then there is this comment – please do not laugh too much: I worry it will be expensive to keep clean, resulting in the ethereal quality conveyed in the renderings going missing most of the time. Yep, he did say that. He is worried about its cleaning! Take a look around at public art anywhere – how do they clean them? Now there’s a major concern for not having public art! Then he let’s us all know just how much he does not understand about any artworks. He says: After the first one or two sightings, I don’t think it will engage with viewers at an intellectual or emotional level. I agree, that I doubt this artwork will engage him at any intellectual level. But who needs to worry about attempting to cater for any mundane and confused thinking as portrayed by such an ‘urbanist’. Later our urbanist goes on about how the locals should be able to identify with this work. This is the same Urbanist that dumped on the locals in the outer Melbourne suburb of Tecoma who did not want the shock of a MacDonald’s outlet in their main street. Our urbanist has a habit of criticising locals for wanting to have their say on local aesthetics. Now he is using the same argument to be negative about an innovative approach being taken to public art by the City of Sydney. In amongst the urbanist’s comments on this art initiative, there are a few sly dog-whistle criticisms of Clover Moore, the Lord Mayor of Sydney. Surely our Melbourne urbanist is not joining in the conservative led bullying of Clover Moore, the popularly elected mayor! Surely he is not a member of that planners boys club that dominates our major cities and who have done a great job of selling out to the Property Council lobby instead of looking after the citizens! 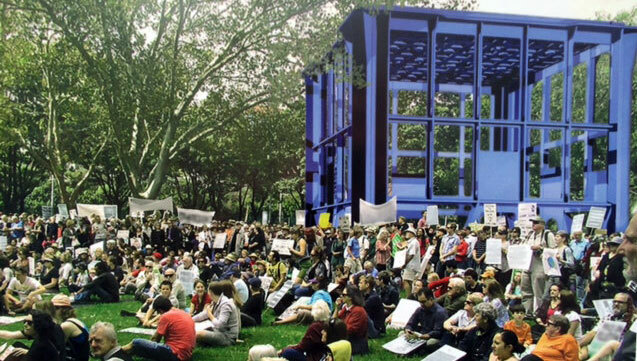 And as a final note our urbanist puts the boot into the other artwork (above). I would hazard a guess that such an artwork would be WAY outside his limited intellectual realm of understanding! I think there should be many of these scattered across the country. To finish, such people as this Crikey urbanist are dangerous in that they lack the aesthetics to understand how artworks could bring enjoyment to our many urban places. Such urbanists usually do not comprehend FUN. Full marks to the City of Sydney for this creative initiative. click here. A big fat zero marks to the Crikey urbanist for such a silly and waste-of-space article. Be warned this level of dangerous crap is not unusual for him. More later.